Starlight Stage’s second event, “Nation Blue”, is about to startstarted! Apparently the game freezes if you play the song in 2D.This has been fixed. Must Song’s song list is out. Our copies of “Dreaming” and Animation Project 04/05 have arrived! We’ll release the “Dreaming” PV likely soon after we finish Mobamas. I applied for a ticket to the Greemas 3rd Live at Osaka Day 2. Let’s see how that goes. Thanks to heyman for QCing, and Jocko for typesetting and the 9001 songs in this episode. Yeah, only 3 Episodes to go ! You can do it, keep on fighting ! I thought there were 4 left. Damn. will you do the bd for this anime? Yes, but we don’t plan on starting work on them until after we are done with the airing episodes (and other planned Imas releases). Is this a bug with your website. I typed in the wrong url and got this. I saw the reverse of this a couple of days ago. 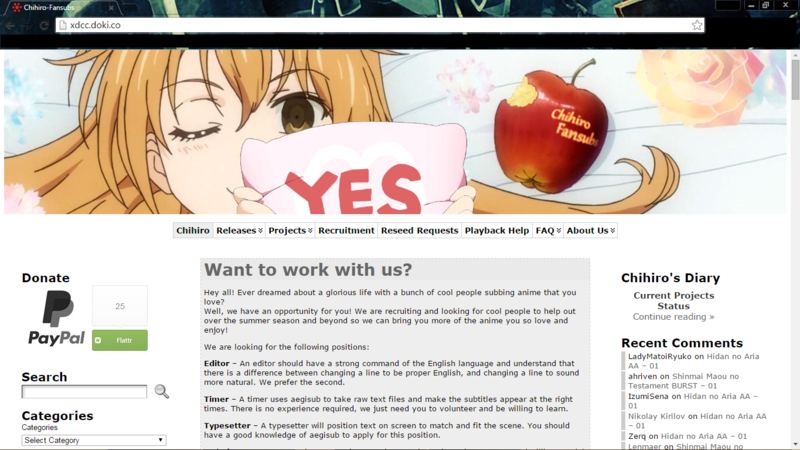 I went to Chihiro’s domain through my RSS, and the address bar said chihiro-subs(dot)com, yet it was Doki’s website. It was fixed in less than a minute though. I’m sure a lot of other people saw it too since the reason I checked was because a bunch of Doki’s entries popped up for Chihiro in my RSS feed. Damn finally an episode having concert after concert and was going good till best girl Shimamuu having issues. Her pretty smile is gone… Ana and Minami had the best songs imo and Triad right up there. @9:35 Does anybody know what song that is? No lyrics was heard and those beats were nice. in Media Player Classic HC ? I’ve got the of latest Versions MPC-HC, LAV-Filters and madVR but all I got is the audio but not the video. So I like to know if some kind person here can give me the settings for the Software I mentioned above, so that I can get the audio and the picture too. I played Nation Blue in all four settings (2d and 3d) on Debut and Regular modes and beat them. I use a Samsung Galaxy Tab 2 10.1 tablet though. *shrugs* could be a hardware thing. It was a software bug that they probably fixed by the time you started. Now that’s what I call service. Too bad everything didn’t get patched so quickly! They fixed it pretty quickly, yeah. Cygames generally take longer with the main game in my experience. Thanks. Gonna wait for the last chapters to see it all at once. Thanks again. I know this is kind of a dumb question but I need to ask. what is MOBAMAS? is it an anime, manga, manwa, or a game perhaps?? tried MAL but nothing come out. It’s a nickname for Mobile [email protected]…in this case Cinderella Girls mobile game. They nicknamed the original [email protected] game [email protected] So Mobamas is an extension of that. Btw: are you playing the new android game (starlight stage) or the older one? Hmm, I don’t have any existing interest in Taiko at all but Must Songs has a pretty tempting song lineup. What is Must Song? A compilation album? Oh, this one game! I remember now, thanks. lol it does not crash on 2D. this is probably an issue on your end. that is good to know. thank you for the link. maybe the game couldn’t handle 700+ notes lol. Any ETA for the next episode of Mobamas?